Gil Morris and I tried to fly today at the Shelby Airport. 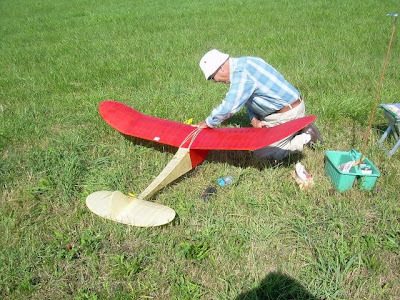 Gil did some test glides on his folding wing model. 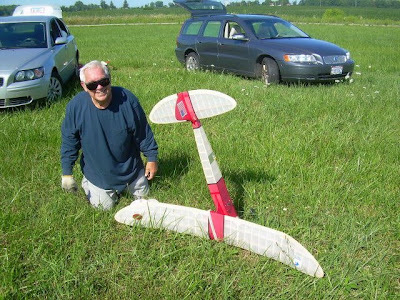 He has to fly it at a larger field. The Albatross give him some problems with the ignition system. 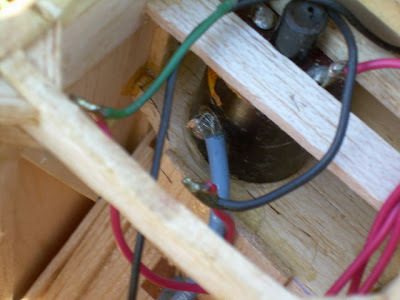 One problem occurred when the hi tension lead broke at the solder connection to the coil. I (Bucky) glued it back on with thick CA. Bingo he got spark and the engine ran in short bursts. There is another problem which was not solved on the field. No flights on the Albatross. 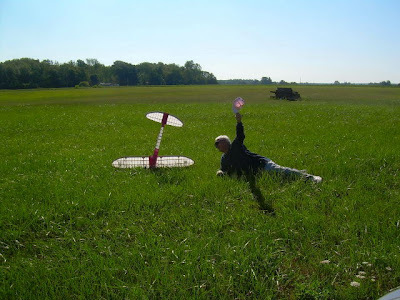 I test glided the Super Phoenix several times. I had to shim up the leading lead of the wing about 3/8 of an inch. in order to achieve a flat glide. Also add a 1/16 shim under the trailing edge of the stab. This shim screwed up the locking shims for the rear of the stab. Which also caused the rudder to twist to the right very slightly due the DT Rubber Bands. Well we had a glide lets try the first power flight. As you can see from the photos the model banked sharply to the right and came right back to me. Luckily the engine quit running but I hit the ground and the model crashed in front of me. One bent landing gear. No problem to fix. All day long I kept adding left thrust and removing the incidence in the wing. As the flights got longer the glide showed a slight stall. Finally I was down to 1/16 incidence in the wing and removed the 1/16 shim under the stab trailing edge. This lock the rear shims back in place and the rudder back at natural. Gil told me to increased the engine run time. I was using an old Elmic timer. It was a pain to try to set a time. It took about an half hour to set a repeatable time. 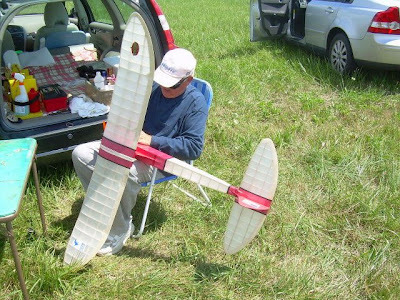 We wanted to get a higher altitude so we could check the glide. Well we got a higher altitude but the glide was straight as an arrow and heading towards the hangers. Bingo it hit the front of the hanger just below the roof. The wing popped off and slide on the roof and the rest fell to the ground. Damage - the left metal motor mount bent slightly. Order a Texas Timer. It is on order! Rest up from one hectic day. I was so tired that Gil chased my second last flight. He is in his eighties, I am in my late seventies.